When I went off to college, I had a limited knowledge of what occupations and degree paths I could take. Because I loved traveling, I ended up getting a Bachelor of Arts degree in Cultural Anthropology (don't ask me what I thought I'd do with that degree)! But, I'm not the only person I know who's college major focused on an activity that they loved. I have numerous friends who majored in English just because they loved to read or write. If you have an English degree and you're looking for a work-at-home job there are lots of great options available to you — many that you probably never even considered before. 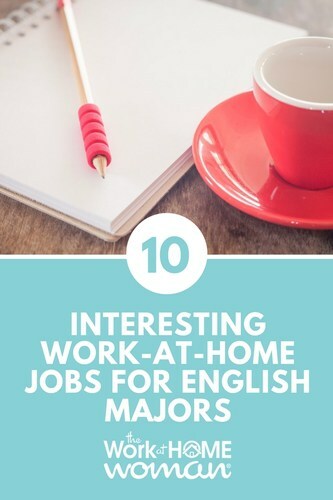 Here are 10 interesting work-at-home jobs for English majors! Intrigued? Check out this in-depth post to learn more about proofreading careers. 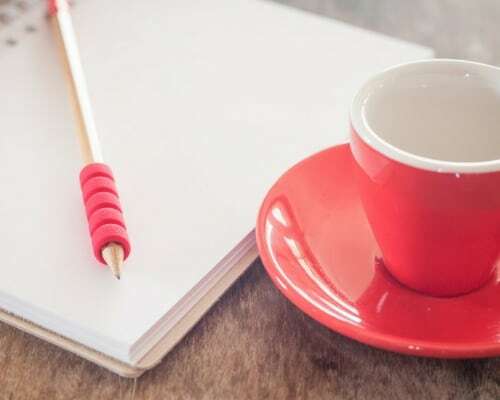 From newspapers and magazines to blogs and websites, the written word is more popular than ever, so writers of all kinds are in high demand. With so many options for freelance writing work, it's smart to specialize in one area or type of writing. Writers with experience may want to explore writing for women’s magazines or other publications with a large circulation. Fans of romance novels or other genre fiction might try their hand at writing a story of their own, like this highly successful mom from Pittsburgh. People with a persuasive streak could have what it takes to become a copywriter. Prefer to remain behind the scenes? Try your hand at ghostwriting. Here are just a couple of places to find freelance writing gigs. Read the basic steps for how to set up a blog here. Anyone can create a blog—even those who aren’t computer savvy! Starting a blog is low-cost and lots free resources readily available. In fact, here are a few of my favorite free blogging resources to get you started. Test scoring work involves reading through essays or short answers, reviewing student portfolios, checking math problems, and scoring a variety of assessments like the ACT. Many of these jobs are on a contract or project basis, and most companies provide comprehensive training. You can find test scoring work online, and there are many test scoring work resources available to help you learn more. ESL Teachers (or English as a Second Language Teachers) work with non-native English speakers to help them grasp the fundamentals of reading, writing, and speaking in English. Some ESL jobs require candidates to be bilingual, but other opportunities involve teaching or chatting in English only. Tutoring is perfect for individuals with a strong knowledge of one or more subject areas who enjoy teaching one-on-one. Tutoring is open to any subject from math to science to history. Since writing is a critical skill in many professions, English majors with a mastery of language are especially in demand for tutoring positions. Think tutoring might be the right way to go? Read more about the tutoring profession from home. Editing and proofreading require similar skills but perform different functions. While proofreaders check specifically for errors in a document, editors will also make structural changes like rearranging content, removing content completely or changing specific wording within a document. Freelance editing projects could include journal articles, whitepapers, or drafts of novels. Individuals with experience and a strong eye for details can become excellent freelance editors. Read this post for in-depth info and more editing opportunities. This site and others offer a way for teachers to earn extra money while exchanging ideas, inspiration, and knowledge. Read more about Teachers Pay Teachers and learn more ways to earn money selling teaching materials online here. Transcription is the process of writing down the spoken word. Transcription jobs are often specific to the medical and legal fields, but there is a large demand for general transcription work too. Individuals with good listening skills and fast typing abilities could become great transcriptionists. Transcription work is often billed by the amount of audio transcribed in a given period, so it pays to be quick, but accuracy is the most critical element of the job. There are plenty of options online for transcription work. Those with transcription skills can read this post for a list of more transcribing opportunities. An Internet researcher finds and delivers answers to people who need them. Depending on the project, Internet researchers investigate all kinds of topics from specific scientific queries to finding information to help with market research. Like tutoring, it helps to have a high level of knowledge in a particular area. Internet researcher could be the perfect job for English majors and anyone with a natural curiosity and a knack for finding the right answer. Read more to explore the world of Internet research. There are many work-at-home jobs for English majors. From writing to research and from tutoring to editing, there really is something for everyone with a love of language! Good luck in your search and as always let me know if you have an idea not listed here. Great job picks ;) and these are all relatively easy fields to jump into with or without a degree, which is awesome for those looking to start immediately. I personally work in transcription and proofreading, it’s good work and it pays reasonably well. Glad you enjoyed the list, Loretta! How long have you been doing transcription and proofreading?